This one is rather urgent as the vote on Pruitt is scheduled for 4 PM TODAY. Phone lines should open up shortly so GO GO GO. And please share widely. If you're in a rush, just scroll down for the link to find your Senators numbers and the script you can use. Call your Senators first thing this AM to urge them to delay today's vote on Scott Pruitt, Trump's pick for head of the EPA until thousands of emails he exchanged with oil and gas executives as Oklahoma Attorney General are released. Groups requested the release of these emails two years ago (still waiting) and Democrats in the Senate have also requested to view them as part of the confirmation process. A judge just ordered that he needs to release them yesterday but unless we can delay the vote (or stop Pruitt altogether) they won't arrive in time. 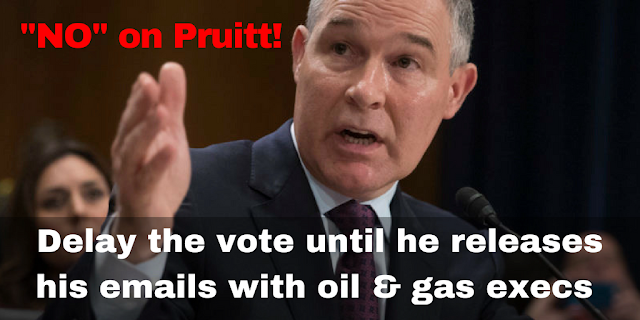 And if the vote cannot be delayed, they need to vote NO on Pruitt who is a long-standing enemy of the EPA who will be only too happy to follow through on Trump's orders to "get rid of it." Even workers at the EPA are calling their Senators to urge them to vote No in an unprecedented show of activism. Here's the NYTimes piece about this. 2. Here's your script: "My name is NAME. I'm a constituent calling from TOWN/CITY. I don't need a response. I am calling to urge the Senator to delay the vote that's scheduled for this afternoon on Scott Pruitt, Trump's pick for EPA chief until he releases his emails per the judge's order. If the vote cannot be delayed, I urge the Senator to vote NO on Pruitt who has no place in the EPA, an agency he has fought against throughout his career. Thank you for taking the time to pass my comments along." 3. Please share this email widely. We've got to stop Pruitt.